Thank you Simbad... I loved your nick and this lovely kitten there in your photo...Simbad by any chance? lovely plant Aleyna, we have it here at Kew but I have never seen it in bloom. Yes Aleyna thats are birman Symba, but we call him simbad because he usually is,lol. LOL Simbad... is he a mischief lovely boy? I confess afraid to do it, but I need to and want to as well. Would like to give one to each one of my children. I almost can see that very short old lady over her flowers and plants... "time to move to the shadow... time to move to the sun... time to hide of the cold...."
If you have any tips about spreading the plant's bulbs, I'll appreciate it. It does look like a bulb, so it should be clear when you unearth them, just separate the bulbs. Of course after flowering when green growth initiates. If it is a rhizome, just cut the large root in half or in sections with a growing shoot on each. I'm guessing they don't go dormant there (dying back to the ground), so divide after flowering when its green growth initiates. so, my next question is.. should i dare to spread it now, or wait till it goes dormant? If it does go dormant, that should be a good time, no damage since the roots will have died back too. It might stress them doing it now, though many things are more resilient than we guess. I'll wait until winter when it goes dormant to spread the bulbs. 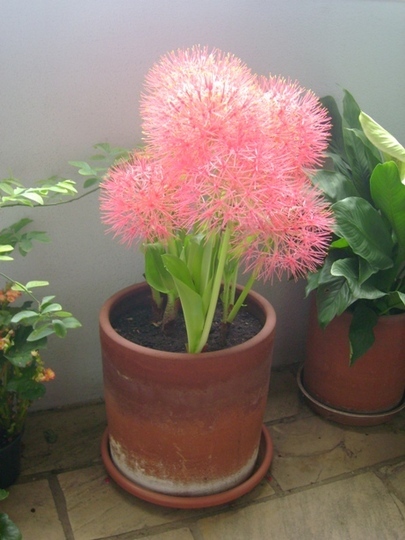 This photo is of species Scadoxus multiflorus.